Today, the name "Jurassic" conjures up images of the phenomenally successful book and movie, "Jurassic Park". It is quite true that the dinosaurs dominated the land fauna -- although many of the dinosaurs featured in "Jurassic Park", such as Triceratops and Tyrannosaurus rex, did not evolve until after the Jurassic was over. The largest dinosaurs of the time -- in fact, the largest land animals of all time -- were the gigantic sauropods, such as the famous Diplodocus (pictured at lower left), Brachiosaurus and Apatosaurus. Other herbivorous dinosaurs of the Jurassic included the plated stegosaurs. Predatory dinosaurs of the Jurassic included fearsome carnosaurs such as Allosaurus, small, fast coelurosaurs, and ceratosaurs such as Dilophosaurus. The Jurassic also saw the origination of the first birds, including the well-known Archaeopteryx, probably from coelurosaurian ancestors. But there was more to life than dinosaurs! In the seas, the fishlike ichthyosaurs were at their height, sharing the oceans with the plesiosaurs, with giant marine crocodiles, and with modern-looking sharks and rays. Also prominent in the seas were cephalopods -- relatives of the squids, nautilus, and octopi of today. Jurassic cephalopods included the ammonites, with their coiled external shells (upper left), and the belemnites, close relatives of modern squid but with heavy, calcified, bullet-shaped, partially internal shells. Among the plankton in the oceans, the dinoflagellates became numerous and diverse, as did the coccolithophorids (microscopic single-celled algae with an outer covering of calcareous plates). Land plants abounded in the Jurassic, but floras were different from what we see today. 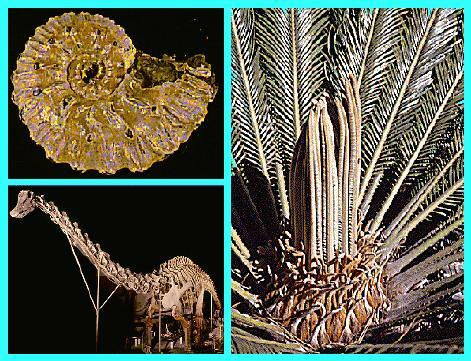 Although Jurassic dinosaurs are sometimes drawn with palm trees, there were no palms, or any other flowering plants, at least as we know them today, in the Jurassic. Instead, ferns, ginkgoes, bennettitaleans or "cycadeoids", and true cycads -- like the living cycad pictured at the above right -- flourished in the Jurassic. Conifers were also present, including close relatives of living redwoods, cypresses, pines, and yews. Creeping about in this foliage, no bigger than rats, were a number of early mammals. Visit also Jurassic Reef Park for information.